Blog / Events / June in Florence: Time for Calcio Storico Fun! June in Florence: Time for Calcio Storico Fun! June is here and the official start of summer is upon us! If you’re going to be in Florence this month, we highly recommend you try to make it to one of the spectacular games of the Calcio Storico Fiorentino! 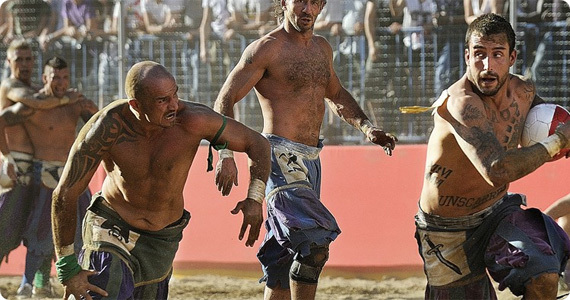 Calcio Fiorentino is a combination of soccer, rugby and big time wrestling originated in 16th century Florence and played today in historical costume. The four teams of the four traditional neighborhoods of the city play against each other in two semi-finals and a final match to determine the winner. Piazza Santa Croce has always been the home to this sport, known as “giuoco del calcio fiorentino” or more simply just as Calcio (“kick”). The square is once again covered in dirt for the recreation of the game and bleachers set up so that spectators can better enjoy the game. 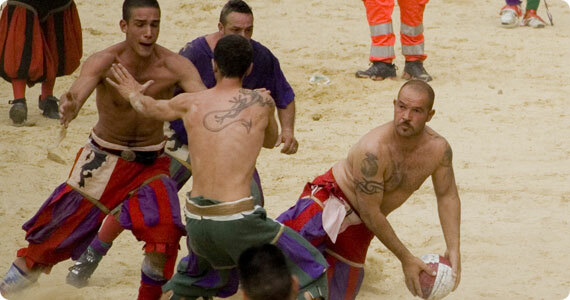 The official rules of the Calcio Storico were first published in 1580 by Giovanni de’ Bardi, a Florentine count. Invented by rich aristocreats, Calcio was originally just played by them and the game took place every night between Epiphany and Lent. Just like Roman harpastum, it was played in teams of 27 and both feet and hands were used. Goals can be scored by throwing the ball over a designated spot on the perimeter of the field with a goal running the width of each end. There is a main referee, six linesmen and a field master. Each game is played out for 50 minutes with the winner being the team with the most points or “cacce”. The prize is a whole Chianina calf. 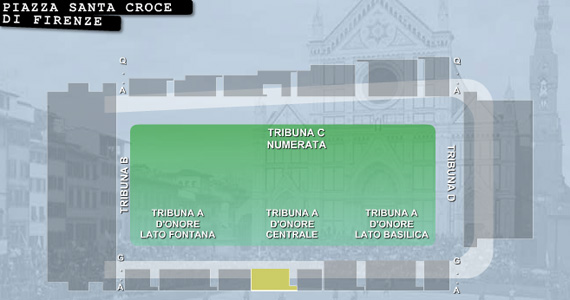 The four teams are: Santa Croce (blue), Santo Spirito (white), Santa Maria Novella (red), and San Giovanni (green). On June 16, the “Whites” will go against the “Greens” in Piazza Santa Croce at 5pm while the “Reds” challenge the “Blues” the following day, June 17. The final match is played on June 24 in grand style on Florence’s feast day for its patron saint, St. John the Baptist. 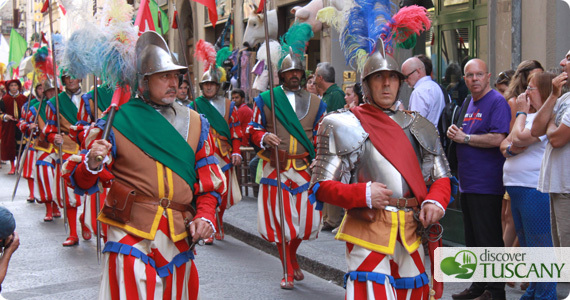 On this day, a splendid parade in historical costume starts in Piazza Santa Maria Novella and heads through the center on its way to Piazza Santa Croce. Each of the four districts is in the parade, you’ll see the players going by as they go to play the final, even those that won’t be playing the last match. The parade starts roughly around 4pm since the final should start around 5pm. Just head downtown, you’ll run into the fun ;-). Also, don’t forget to end the day’s celebrations along the banks of the Arno to watch the spectacular fireworks display launched from Piazzale Michelangelo! We’re hearing that tickets are going fast, so we suggesting going ahead and buying your ticket now online at Boxol.it. Cost goes from 47 euro for the best central seats in tribune A, 37 euro for the lateral sides of this same side tribune A, 27 euro for numbered seats in tribune C (across the way) and then 21 euro for being in either end with the fans of each team (tribunes B and D). Add to this the cost of pre-sales on the website. Not in Florence on the “right” dates? If you are not in Florence on these specific dates, know that the Calcio Storico will also be playing on 2 other dates for charity! On June 15, the veteran players of the Calcio will play a match and all funds raised through tickets will go to the Tuscan Association Against Tumors, and on June 23, the younger members of the Calcio of the Red team will play and all funds will go to the Tommasino Bacciotti Association. Even if this is not a Calcio Storico match, it is a historical reenactment also done for charity: for the first time ever, the “Joust of the Florentine Republic”, a medieval joust on horseback, will take place on June 22 in Piazza Santa Croce. All proceeds will go to the Fondazione ANT that offers home assistance to the terminally ill. So if you’re around on any of these dates, head to Piazza Santa Croce to join in on the fun! The Tuscan Sun Festival 2012 this year in Florence!